The last few months have been really busy for me as though I’m not a professional cyclist in the traditional sense, I do make a living out of cycling through writing, consultancy, digital marketing and brand partnerships and the summer months are always packed with events, races and trips. I attended several events with SKODA, with whom I’ve been working since last year and was delighted to be asked to join their female focused This Is Our Time campaign that aims to shine a light on women’s cycling, boost coverage and encourage participation. 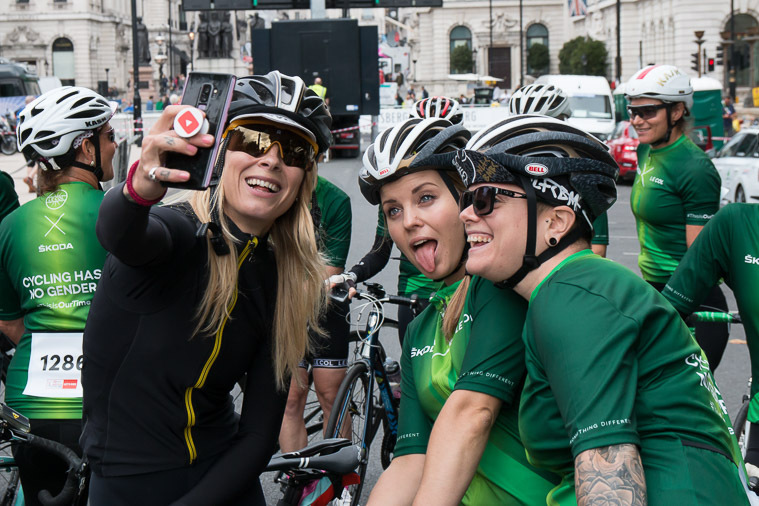 Thanks to SKODA I was able to attend Ride London to support four women I’d been mentoring along with Hannah Barnes, helping them go from never having ridden a road bike to riding 100 miles in one day (over the course of five weeks!). I also flew out to the Tour de France, went to the Ovo Energy Women’s to chat to women mechanics, Directeur Sportifs, soigneur and pro cyclists and went to the final stage of the Tour of Britain where my family and I were able to ride the course before settling into the VIP hospitality area to cheer on our favourite racers. And if that wasn’t sweet enough, they also saw fit to lend me a brand new Kodiaq SUV! Back in Devon, I entered my first road races snagging a 4th place at one of the Cotswolds League races (a vast improvement from my first road race at Hatherleigh at the start of the season where I came second to last!) and I continued a pattern of frequently coming second at various crits. Happily, I did take the top step on the podium at the Regional Champs so I’m now South West Regional Crit Champion. I’m looking forward to more road races next year in Mid Devon colours and will definitely be doing more road races. A big thanks to Epic Coaching for all the help this year. I actually only really got into road racing as a way of training for fixed gear crits, which is my favourite kind of racing. Raced on track bikes with no brakes these closed-circuit races are fast, furious, incredible fun and require high levels of fitness and skill. 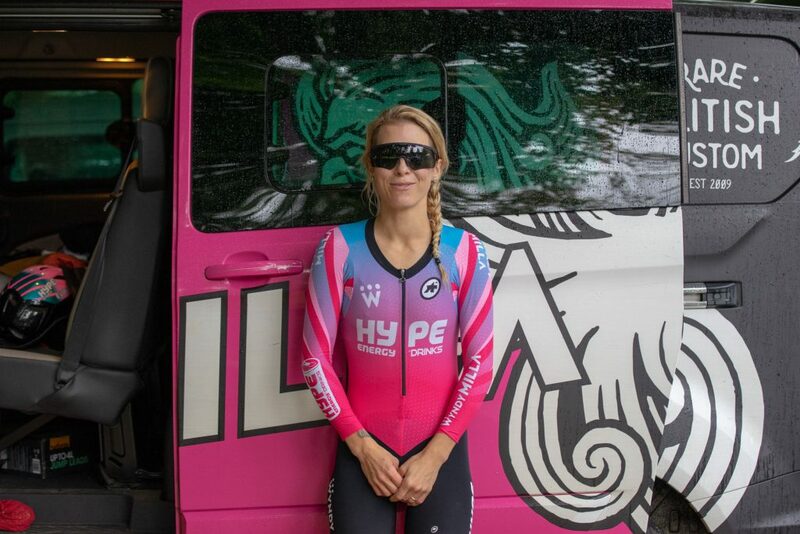 Just to give you an idea of how hard the races can be, the last few fixed gear crits have seen National Champions (such as US National Crit Champion Justin Williams), current Pro Tour riders such as Ivan Cortina and Olympic champions such including Dani King on the start line. 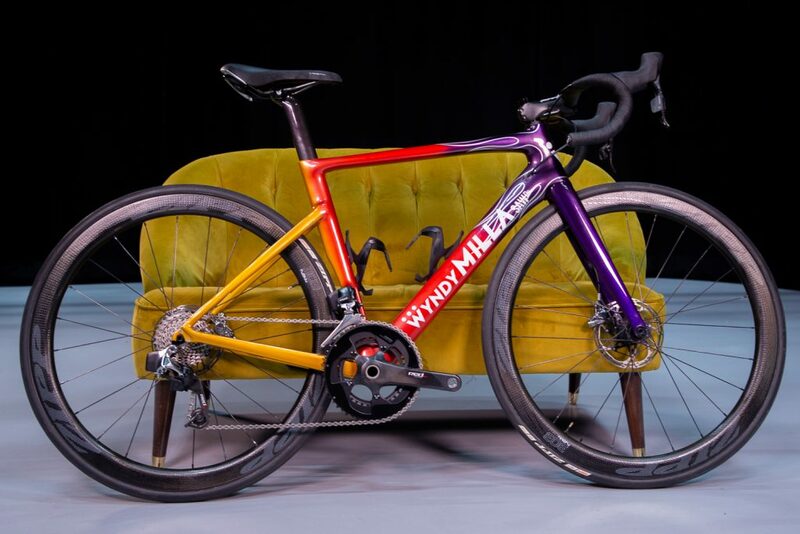 This summer I joined a new women’s fixed crit team Wyndymilla Hype Energy, took delivery of this crazy bike and we set about hitting up as many races as possible. 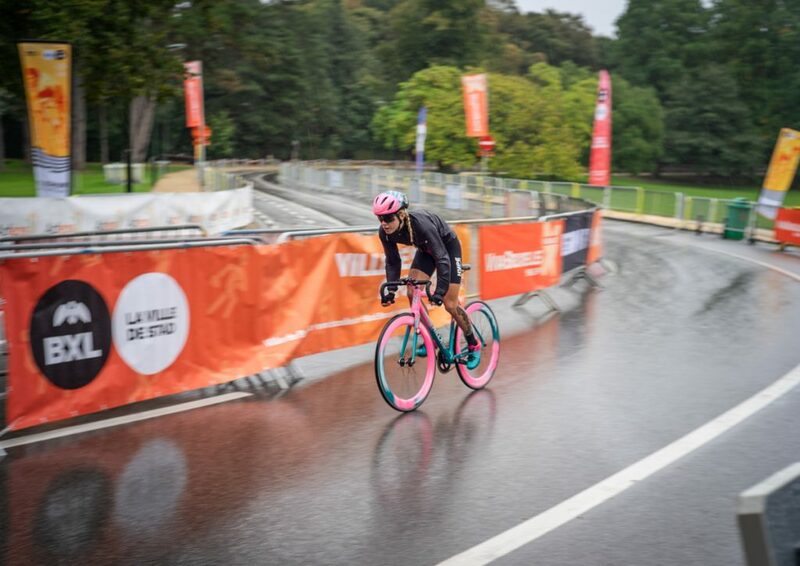 Most recently we raced Brussels City Crit in torrential rain (which I think gave me an advantage!) and got good results – I took home 2nd place and my team mate Keira bagged 4th. I’m currently on my home from the last fixed crit of the year, the legendary Red Hook Crit Milan where, let’s just say, things didn’t exactly go to plan. Stay tuned for the full story! After being introduced by the guys at Wyndymilla, I picked up a couple of dream sponsors this summer – Zipp and SRAM. In case you don’t know (although I’m sure you only wouldn’t know if you’re not involved in cycling in any way at all), Zipp make innovative, legendarily fast, beautiful wheels and SRAM make (amongst other things) the lightest, most covetable electronic groupsets available. So this summer, when Wyndymilla decided to make me the very bike of my dreams, I was able to kit it out with the finest parts from both brands. The dream bike was delivered whilst I was in London, where I was spending the week after winning a YouTube competition. Being selected as a ‘Woman To Watch’ by Youtube, is something I can still barely believe. I only started making weekly YouTube vlogs about my cycling adventures at the end of last year, having previously been quite sporadic with my content and clearly the regularly schedule has helped increase my followers as I’m now edging close to 25,000 subscribers on my channel. The week-long creator camp was a chance to learn new skills, experiment, be inspired and meet other video makers but I think the best thing for me was a feeling that YouTube believe in me. We heard from amazing speakers such as Jess Phillips MP who talked about the importance of female voices and using our platform to connect and inspire, after sharing worrying statistics about the number of storylines in films, column inches in newspapers and overall appearances women make in traditional media. She urged us to continue using new ways of connecting with people and telling our stories, something I fully intend to do. In between all the events and races I attended over the summer, I did actually manage to spend some time in Devon enjoying the fantastic area where we live. Though the good weather didn’t last as long in the South West as it did, say, in the South East, we did enjoy the incredible heatwave in June/July and summer 2018 will forever be unforgettable due to what happened in Devon rather than elsewhere. Taking our daughter for her first ride on my bike was an incredible moment for me, one that can’t be beaten by any amount of travel and what I’m most excited about next is more cycling time and more cycling with my beautiful, funny, courageous, inspiring little girl – she is a real blessing.